Product prices and availability are accurate as of 2019-01-13 11:45:41 EST and are subject to change. Any price and availability information displayed on http://www.amazon.com/ at the time of purchase will apply to the purchase of this product. 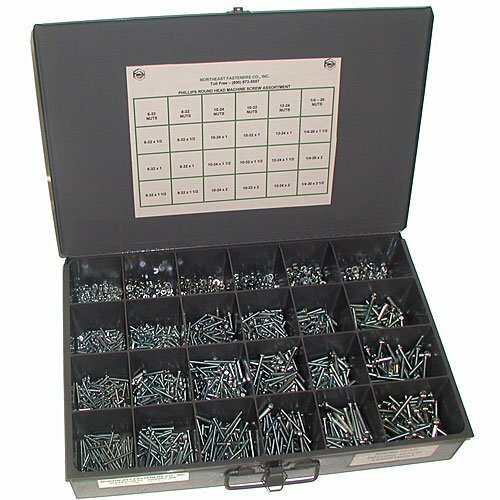 The assortment includes a large metal compartment box with 24 compartments, locking latch and metal handle. Items will not spill over to other compartments when closed. •Width 18", Height 3" and Depth 12". •Manufactured of prime cold rolled steel and finished in rust and acid resistant baked enamel. •High impact plastic inserts with rounded scoops for easy removal of small parts. 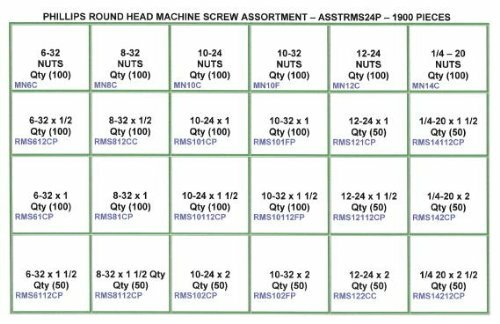 Machine Screw and Nut Assortment - Coarse (USS) and Fine (SAE) Sizes #6, #8, #10, #12 and 1/4 Inch Lengths 1/2, 1, 1 1/2, 2 and 2 1/2 - Click Other Image View Above For Detailed Product Information Includes 24 Hole Metal Storage Compartment with Latch Enjoy some of the highest quality fasteners on the market!